Dry or wet ashing of petroleum products, for either percent ash determination or in preparation for elemental analysis, is typically tedious and time-consuming. Quality control checks to identify process problems such as catalyst spillover, custody of transfer testing to ensure that customer specifications are met, and evaluation of new feed stock to see how it will affect or perform in a given process are routinely performed in petroleum laboratories. 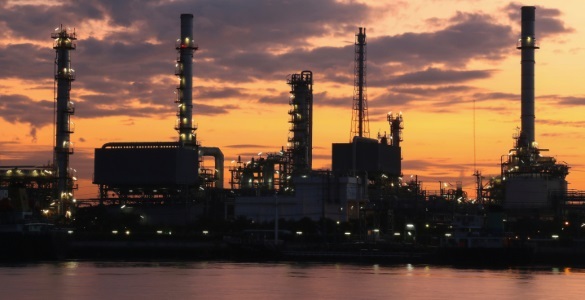 A joint studyconducted by Valero Refining Company (Corpus Christi, TX), CEM Corporation (Matthews, NC), and an independent testing laboratory determined the viability of using microwave-based methods to improve sample preparation for petroleum products. The objective of this study was to compare the microwave method with the ASTM/UOP methods to determine if the microwave method is a viable alternative for (1) percent ash determinations and (2) the preparation of samples for elemental analysis. As a basis for this comparison, Table 1 illustrates some major differences between the microwave and ASTM/UOP methods. The microwave magnetron/waveguide/cavity arrangement operates at 2455 MHz. Inside is an ashing furnace insert, which has a silicon carbide heating element surrounded by a microwave transparent insulating material. Absorption of microwave energy by the silicon carbide results in the release of heat energy.2 A type “K” thermocouple is connected to the internal computer to control the heating of the silicon carbide element up to 1200 deg C. An exhaust system removes hydrocarbon compounds, soot, smoke, and heat from the microwave cavity to a fume handling system. The oil is diluted with an appropriate solvent and then aspirated directly intothe flame of the AAS. This technique is good for the organically soluble analyte. However, inorganic or elemental forms of the analyte may not be reduced to ground state atoms in the flame of the AAS. The oil is burned off over a Bunsen burner and ashed in a muffle furnace.This technique is suspected of metal loss because of the mechanics of the burning oil. Superior to direct analysis but time-consuming and tedious. The oil is reacted with fuming sulfuric to produce a coke-like char, then ashed in a muffle furnace. Superior to direct analysis and dry ashing, but time-consuming and tedious. The oil is placed into the microwave muffle furnace and the temperature isramped up, evaporating the sample to produce a coke-like char, then ramped to the ashing temperature. Superior to dry and wet ashing because time required is decreased, metal loss is avoided, and the process is automatic and unattended. This method uses larger sample sizes for more accurate results, and is faster and less tedious than wet digestion. The oil is digested with sulfuric and nitric acids. Superior to other methods, but time-consuming and tedious. - UOP Method 800-79, Vanadium, Nickel, and Iron in Petroleum Oils byAAS - modified. At both Valero and the reference laboratory, the UOP methods were run in a modified procedure. For purposes of this study, the current and accepted laboratory procedures were used if they differed from ASTM or UOP methods. The modifications to the UOP 391 and 800 methods consisted of using the ASTM D 482-91 method to dry ash the samples instead of fuming with H2SO4 prior to placing them into the muffle furnace. Where this was done, the data was labeled as UOP391(m) or UOP800(m). Otherwise, the ASTM or UOP methods were followed and the data were labeled with the appropriate method designation. This study anaylzed a two-cycle motor oil, the end product of a blending plant, which is normally ashed using ASTM D874 as a quality control measure to assure that the additive package is correct in the finished product. All other testing takes less than one hour, but the conventional Bunsen burner/muffle furnace ashing method requires over three hours to complete. The goal of this study was to develop a method that would give a result in under one hour, so the batch could be released and processed. Using the CEM Phoenix Microwave Muffle Furnace, a four- place analytical balance, and platinum crucibles, 50 grams of sample were weighed into the crucible and the crucible placed into the microwave. After the sample was carbonized, it was removed from the ashing chamber and allowed to cool. A sufficient amount of H2SO4 was added to wet the ash and the crucible was placed back in the microwave to complete the ashing. After ashing, the crucible was placed in a desiccator to cool and then weighed. Total time from initial weighing to final percent sulfated ash determination was 55 minutes. Table 2 shows the percent sulfated ash from six replicates of the same sample in the microwave versus the results from the ASTM D874 conventional Bunsen burner/muffle furnace method. The specification for this product is not more than 0.0040% sulfated ash. The tabulated results show a range between four and eight ppm, well within product specifications. A heavy cracker slurry sample was chosen for percent ash determination by gravametric methods and elemental analysis for V, Ni, Fe, Cu, K, and Na by Atomic Absorption Spectrophotometry. This product was chosen because of the need for a more rapid and less labor-intensive analysis method. The conventional method requires over ten hours, is labor-intensive, and is subject to splattering and foaming. The microwave method takes less than five hours, and requires no operator attention until the process is complete. The heavy cracker slurry was tested as received and blended with Boscan 6 oil, yielding the stock sample A, and five blends (B through F), covering the range of 0.10 to 450 ppm for elemental analysis and averaging 0.085% ash content. Each ash analysis began with a 10 gram sample size. Metals results were obtained from the ash analysis residue, except for the data labeled UOP-391 and the data from the independent testing laboratory, which used one aliquot for ash and a second for elemental analysis. Table 3 shows percent ash results from the ASTM D482 method versus the microwave method. Duplicate samples were run on three separate days. Groups A and B are from the Valero laboratory, and Group C is from the independent testing laboratory. The ash levels appear constant for all blends because of an ash contribution from the Boscan 6 oil. Also, the values in Group C show variability because they were not homogenized prior to sampling. The tabulated results compare elemental recoveries for V, Ni, Fe, Cu, K, and Na. The UOP 391(m) method was chosen for the work at Valero because the scope of the method included all elements of interest. The independent testing laboratory chose to use UOP 800(m). In Group A the acidified ash residue solution was boiled, then diluted and analyzed. In Group B the acidified ash residue solution was boiled until dry, reacidified, then diluted and analyzed. This procedure gave better comparison with the UOP-391 data than the data from the independent testing laboratory in Group C, which is a dry ash method without fuming with H2SO4. The higher vanadium values reported by the independent testing laboratory (Table 4) may be the result of the different standard solutions called out in UOP 391 and UOP 800. The vanadium analysis was also rechecked using the UOP 800 method. The sample was ashed in the microwave at the Valero laboratory, analyzed, and then run at the independent testing laboratory. This data is shown in Table 5 where the vanadium values are shown to be in agreement. The microwave method compares favorably with the ASTM and UOP methods for both percent ash, percent sulfated ash, and sample preparation for elemental analysis. It is fast (one to five hours versus three to ten hours), automatic, and unattended. The method’s speed, plus full confidence in its results, permit timelier quality control checks to identify process problems and steer the process back into a pattern of conforming output, custody of transfer testing to ensure the customer specifications are met, and an evaluation of new feed stock to see how it will affect or perform in a given process. 1 Carr, S. E. and Moser, C. R., “The Use of Microwave Technology for Dry Ashing Procedures,” CEM Corporation, presented at Pittsburgh Conference, 1991. 2 Kingston, H. M. and Jassie, L. B., “Introduction to Microwave Sample Preparation,” AmericanChemical Society, 1988. 3 UOP Method 800-79, UOP Inc., 1979.